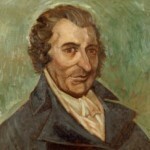 Thomas Paine is probably the most controversial figure of the American Revolution. A newly-arrived American, Paine’s writings during the tumultuous year of 1776 helped to kill off many of the lingering doubts about separation and independence. To some, Paine is the beating heart of the revolution – not just for his radical ideas about government, society and religion, but also how he expressed and communicated them. To others, Thomas Paine is a historical embarrassment, a figure obsessed with tearing down the old order to the point of destabilisation and destruction. Their Paine is ‘Mad Tom’, a crazy man, a leveller, the man who cheered on the French Revolution and encouraged its worst excesses. This division of views about Paine is reflected in popular and scholarly histories of the American Revolution. In some circles, Paine is lavished with praise for his radicalism and his forthright pamphleteering. Some writers mention him only briefly – and many don’t mention him at all. 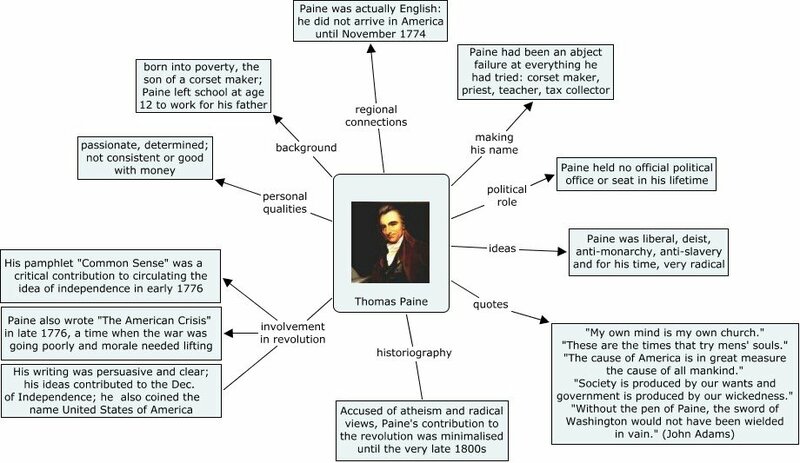 Paine is especially ignored in American school textbooks, perhaps because of his alleged atheism, or perhaps because attention on Paine draws the focus away from better-known revolutionaries. Paine was born in Norfolk, eastern England, in 1737 and received a decent education for the time. As a young man, he tried his hand at several occupations – privateer, corset-maker, tax collector, schoolteacher and tobacconist – but Paine was not particularly good at any of them. 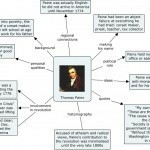 By the time he was in his thirties, Paine was living in London and working for the government collecting excise and duties. He was also politically active, writing a long pamphlet about the mistreatment and poor salaries for excise-collectors. While in London he was introduced to Benjamin Franklin, complaining to the American about the lack of opportunities in Britain. Franklin encouraged him to emigrate to the American colonies, giving him a letter of reference. Within weeks Paine was crossing the Atlantic. It was a voyage which very nearly proved fatal: Paine contracted typhoid from contaminated water and was half-dead when the ship docked in Philadelphia. It would take him more than a month to recover his health, after which Paine took a job editing a popular magazine. He acquitted himself well at this job and became reasonably well-known on the streets of Philadelphia. An emphasis on America as a continent, and the absurdity of it being ruled by Britain, a small island. That America needed to separate itself from Europe, which was riddled with old hatreds, divisions and privileges. Condemnation of the concept of monarchy, highlighting its contradictions and querying the relevance and ability of absolutist kings. Attacks on hereditary succession and privilege, since one’s “descendants might be far too unworthy to inherit them”. An exploration of the relationship between society and government, which Paine argued was a “necessary evil”. A contention that independence would benefit America commercially and financially, rather than destroying her. At least twice Paine recommends a “continental conference” to construct and debate a written charter (constitution). Above all, Paine appealed to readers not to be swayed by tradition; he wanted them to break from history, not to be held captive to it. The impact of Common Sense is undeniable – though it is often grossly exaggerated. Estimates of copies printed often run into the hundreds of thousands, when in reality it was probably between 80,000 and 100,000. Nevertheless, even this lower figure would have made Common Sense the best-selling book on the continent, aside from the Bible. Paine’s fellow revolutionary – and the man who suggested the title Common Sense – said that it “burst from the press with an effect that has rarely been produced by types and paper in any age or country”. The first print run, which was published anonymously, sold out in a matter of days. Excerpts were read aloud in schools, in town meetings, in taverns and from the church pulpit. George Washington encouraged his officers to read it to their troops. By the third edition, Paine’s pamphlet was being sold in at least five different colonies. A German translation was available in Philadelphia; a French version could be obtained in Quebec. By June, copies could be found on the streets of London. With a cover price of sixpence, the sales of Common Sense could have made Paine a relatively wealthy man – but he was duped out of the profits by his first publisher, then donated the proceeds of later editions to the Continental Army.